Ten years ago, fans said “So long!” to our favorite mother-daughter duo: Lorelai and Rory Gilmore. Their quick-wit and nonstop pop-culture references were #goals for many. But Gilmore Girls was much more than a show about a hip mother and daughter. They lived in a world full of wildly interesting, but deeply lovable characters who added to their dynamic and made us love them more. 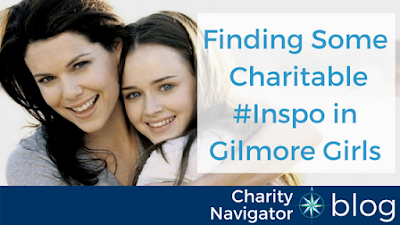 Let’s take a moment to gain some philanthropic #inspo from some of our Stars Hollow favorites. As a single mother, Lorelai is committed to working hard to provide her daughter with everything she needs to be successful including a private education and an enviable knowledge of pop culture. In addition to Rory’s success, she supports and encourages her friends and works toward her own advancement by completing her degree and starting her own business. As a strong, independent woman, Lorelai would be excited by the work of Girls, Inc. a four-star charity that recognizes the social and economic power of girls. This organization fights for girls to have better access to education and healthcare. They know that access to these essentials will empower girls now to be more successful later on. Throughout the series, Rory worked toward one goal: becoming a journalist. She collaborated with her frenemy, Paris, on her high school newspaper, and became the editor of the Yale Daily News in college. Following graduation she took a job as a reporter on the 2008 Obama campaign (remember, the show wrapped in 2007). As an individual committed to her craft, Rory would support the Committee to Protect Journalists. This 4-star organization exists to maintain freedom of the press and reporters around the world. They fight for a safe place for journalists to report without fear of reprisal or retribution to ensure we have access to quality reporting and information. As Stars Hollow’s (CT) resident foodies, Luke, owner of Luke’s Diner, and Sookie, culinary mastermind at the Dragonfly Inn, would support the work of the Connecticut Food Bank. This highly-rated organization provides food and resources to people in need around Connecticut through a network of partner organizations and Feeding America. Sorry Dean fans, but we all know Jess was really who Rory was meant to end up with. While traditional academics were not his cup of tea, Jess certainly valued the world reading opened up to him and would support the efforts of Literacy, Inc. This highly-rated charity works to expand literacy education so that every individual can access the many worlds that books and reading provide to us. For much of the series Lane Kim, Rory’s best friend, has a dark secret--her love of rock music. Eventually her secret passion comes to light and she is openly the drummer of local band, Hep Alien. Lane would support the work of Education Through Music, Inc., an organization that fights for access to music education in low-income schools. This highly-rated charity recognizes that this is an important resource and outlet for many youth and access to it in school is essential. So there you have it, a little charitable inspiration from some of Stars Hollow’s most lovable characters. Who’s your favorite character and, if they’re not on this list, what charity do you think they’d support?